114 mm/45 Mark II BD8 х 2 pcs. 40 mm Bofors Mk VII12 х 1 pcs. 40 mm/39 QF Mark VIII5 х 8 pcs. 40 mm Bofors Mk VII20 х 1 pcs. 40 mm Bofors Mk VI5 х 6 pcs. 40 mm Bofors Mk IV3 х 2 pcs. Implacable — British Tier VIII aircraft сarrier. Attack aircraft are better suited to battle, with more powerful rockets and a payload that’s greater than that of lower-tier aircraft. Despite the smaller size of British flights and squadrons, they are on par with American attack aircraft in terms of their strike capability. Bombers carry a greater number of them in their payload. The striking power of these aircraft is comparable with the firepower of VIII Lexington’s bombers, which carry out their raids in larger flights, armed with 1,000 lb. bombs. The survivability of these aircraft is such that their HP pool is almost as high as that of American Tier X aircraft. Torpedo bombers have good manoeuvrability, low cruising speed allowing them to make an almost immediate U-turn by using Boost to slow down. Converging, cone-like torpedo spread allowing them to achieve a greater number of torpedo hits if an attack run is carried out accurately. Attack aircraft are slow, with their cruising air speed being virtually identical to that of torpedo bombers and bombers. HMS Implacable was an Implacable-class aircraft carrier built for the Royal Navy during World War II. Upon completion in 1944, she was initially assigned to the Home Fleet and attacked targets in Norway for the rest of the year. 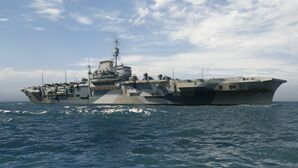 She was subsequently assigned to the British Pacific Fleet (BPF) where she attacked the Japanese naval base at Truk and targets in the Japanese Home Islands in 1945. The ship was used to repatriate liberated Allied prisoners of war (PoWs) and soldiers after the Japanese surrender, for the rest of the year. Implacable returned home in 1946 and became the Home Fleet's deck-landing training carrier, a role that lasted until 1950. She briefly served as flagship of the Home Fleet in 1950. During this time she participated in many exercises and made a number of port visits in Western Europe. She was placed in reserve in 1950 and converted into a training ship in 1952, and served as flagship of the Home Fleet Training Squadron. The ship was considered for a major modernization in 1951–52, but this was rejected as too expensive and time-consuming. Implacable was decommissioned in 1954 and sold for scrap the following year. This page was last modified on 9 April 2019, at 14:07.